Hearthstone East Cottage is a gem of a chocolate box cottage and has every traditional feature that you could think of. 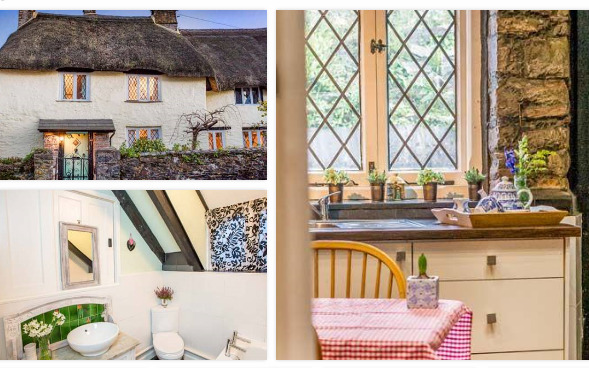 As you approach this beautiful thatched cottage in the quaint Devon harbour town of Brixham, you will know that you have chosen wisely. Once a Devon longhouse, the cottage dates back to the 16th century and is a superb holiday home for anyone wishing to discover this historic part of Devon. On the ground floor are a well-equipped kitchen and a comfortable sitting room with traditional beams and a stone inglenook fireplace with a roaring open fire. Head up the stairs where you will find four bedrooms set on slightly different levels along with a family bathroom. The beautiful rear garden has a patio area and steps leading up to a lawned garden where you can sit in peace after a day spent exploring the Devon coast. The historic harbour town of Brixham is just a mile away where you can see the fishing boats unloading their catch. Close by is Breakwater Beach, one of the cleanest Blue Flag beaches on the English Riviera, which has been recommended by the Good Beach Guide. Sleeps up to 8 across 4 bedrooms, 2 bathrooms.